Hell day with rain and hail, again with falls and sprint resolution among four cyclists. Starting tomorrow, with Arrate and Eibar, everything will change in the Tour of the Basque Country. Schachmann is unstoppable. Against the clock, rising, falling, sprinting, under the hail ... in all conditions it has imposed and has not shown cracks. He has almost all the jerseys, he has escaped the mountain of Bravo. 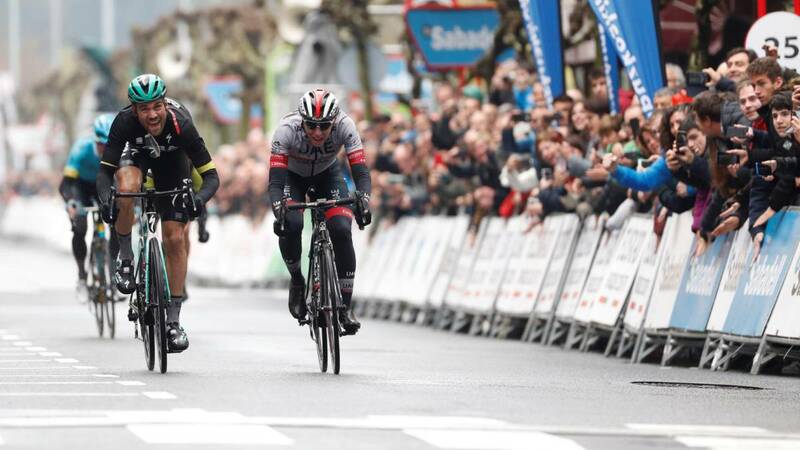 On another event, the German rider has scored the third victory in four days (again ten seconds of bonus for the bonus) in this edition of the Tour of the Basque Country and already manages 51 seconds of advantage in the general on his partner of equipment Konrad and 52 on an Izagirre Ion to which left to 9 '' 'in goal. Everyone sees him with respectful eyes; Of course, starting tomorrow begins a new Itzulia, with the arrival in Arrate and, on Saturday, Eibar. At the hands there is no rain forecast. Mitchelton is eager to impose its hierarchy and Astana has not said its last word (Fulgsang) and Movistar will have to move the tree sooner or later. The stage from Vitoria to Arrigorriaga (with the txuri-.urdin Illarramendi as a luxury spectator on arrival) made an election with a blanket of water. before he decided not to leave Alaphilippe, because of the wounds of war of the previous day, and he left for Belgium. It was decanted by elimination. The day was hellish, with rain, hail, cold and again several falls. One of them crossed out Pello Bilbao, a local option. The good flight seemed to be formed with notable names such as Verona, Williams, Monfort, Grmay, De Marchi, Storer and Iturria. On the way up to Bikotz Gane, part of that cluster was dropped drop by drop, starting with Storer and Iturria. De Marchi and Verona, two accredited cyclists, tightened the chain. Behind the hunting was organized, with Movistar very attentive and the Mitchelton sharpening the group. Edet jumped and made a bridge but they neutralize him soon. The Colombian Betancur also gave an important arreón. After the sprint of Orozco, they tried to find the epic Albasini and Carthy, ahead of a group of something more than fifty units, but they soon threw in the towel. The asphalt was very loaded with water and there were two dangerous descents, of Zaratamo to goal and, this more unknown, a step of about 700 meters on the rise to this Biscayan municipality cradle of good pelotaris. At 13 kilometers to finish the peloton down the adventure of Verona and De Marchi. A new movie was starting. Before the last climb, Lutsenko came in too far in a corner, took out his right leg like a GP motorcyclist to balance himself and went to the ground. They also fell, a little further back after touching the brake, Serry, Honore and Pello Bilbao (seventh overall, 54 seconds) that hit the base of a lamppost. On the climb to Zaratamo, Yates attacked with all the conviction and Schachmann himself responded, followed by Pogacar, who fell nine kilometers from the finish but was able to re-start up, and Fulgsang. went to the limit and Omar Fraile could not stand. The young Slovenian from the Emirates threw himself into the open grave, descending and wearing too much with Yates. He put the leader to the limit on a one-on-one basis, but he knew how to hold on and at the last moment he knotted to victory.